Right? Sybella's voice seemed like it would be so distinct in GM. I think the romance is something that some would love, but I just wanted more from it. The lack of intrigue though, yeah, that was a big disappointment. Wow-we had such opposite reactions! I adored this (much more than GM) especially because of Beast and Sybella's reaction. It sounds like you preferred the historical background of GM and I was overwhelmed by those details so I liked this more personal story. Interesting! Thanks for the review! I enjoyed Grave Mercy but haven't read this yet, and it sounds like I might have some issues with it as well. I guess it depends on the reasons why you liked GM. Hopefully you'll enjoy DT more than I did! I'm sad you didn't like this one more, because I know you were really into GM and wanted to like this one. I never got in to GM (not my kind of read, really), but it sounds like DT dialed down a lot of the things that made GM awesome. Also, hate when a character Says she is all wild and inpredictable, and then act like cookie cutter normal. Also, you should read Quintana of Charryn, Quintana's inner voice is SO NOT lucid, but it works so well. I'm sad too :( You actually might like DT more than I did since you're not as much of a fan of the things I liked in GM (and didnt have in DT). YES! I totally agree about them saying they're so baaaad and then they're not. Is that the Finnikin of the Rock series? I've been meaning to check those out! 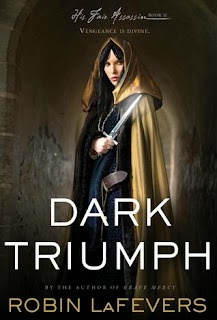 I was underwhelmed by Dark Triumph, as well--even so that I never got around to writing a review. I thought the writing itself could have been better, more complex, and the story was a bit flat. It was such a huge disappointed because I absolutely LOVED Grave Mercy. Now I'm not sure what to think about the third book! Yes, I feel much the same way, on all counts! 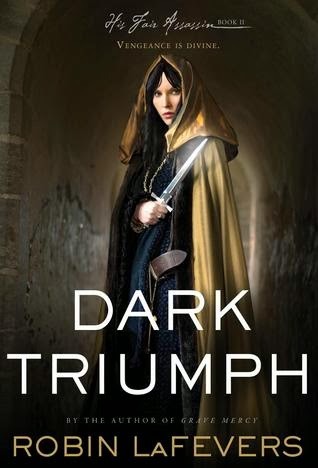 I think I'm still going to try the third book, but I don't think I'll autobuy it unread like I did with Dark Triumph. Hopefully we'll like Annith's story more! Aww, this bums me out so much! I still haven't made the time to read this one yet, but you and I both LOVED Grave Mercy so to hear from you that this one was less than perfect is disappointing indeed! "Sloppy" is not a term I would attribute to Robin LaFevers' writing, so that's surprising! And a shame. Well, I still really want to read this one, but I think I will lower my expectations going into it and that way I won't be so disappointed. That's the hope anyway! I know, right? She is so NOT a sloppy writer! I was super shocked, but I wonder if there was sequel pressure and deadlines? I don't know, I'm just so sad about it. I hope you enjoy DT more than I did! I'll be very interested in reading your review. I've not read Grave Mercy, but I want to because both Aylee and you enjoyed it - so that means its fabulous. I am still reading Throne of Glass and loving that one. I guess I'm going to hop to book #2 in that series than start trying to sort through Grave Mercy. I hear Book #2 in Throne of Glass is supposed to be awesome! Book 2 in Thrown of Glass is AMAZING. Even better than book one! I will say that I didn't expect the Games of Thrones vibe to this one. It was much darker than I anticipated and the pacing was really slow, but I did like the characters enough to enjoy the ride. I'm hoping book 3 goes back to more intrigue like Grave Mercy. Oh bummmmer. I loved GM. Sad to hear but I appreciate your honesty.